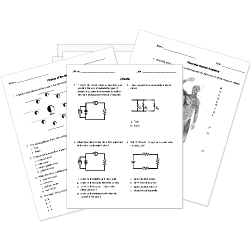 You can create printable tests and worksheets from these Scientific Methods and Applications questions! Select one or more questions using the checkboxes above each question. Then click the add selected questions to a test button before moving to another page. Jackson and Mia want to do an experiment to determine how the temperature of water affects how much salt can be dissolved in it. In what order should they perform the following steps? Step 1: With a teacher's help, bring the water in one of the beakers to the boiling point. Step 2: Pour equal amounts of water into two identical beakers. Step 3: Record how many half-teaspoons of salt are completely dissolved in each beaker. Step 4: Gradually put salt into the water of each beaker, a half-teaspoon at a time. Victoria grows the same bacteria in 20 petri dishes. She places 10 of the dishes in a container with a normal atmosphere. The remaining dishes she places in a container in which the oxygen level is double the normal level. She labels the first group "A" and the second group "B." Which statement best describes the groups? Group A is the control group; Group B is the experimental group. Group A is the experimental group; Group B is the control group. Group A is the hypothesis; Group B is the theory. Group A is the variable; Group B is the observation. Group A is the theoretical group; Group B is the hypothetical group. Homer notices that his shower is covered in a strange green slime. Homer decides to spray half of the shower with coconut juice, thinking this will kill the slime. He sprays the other half of the shower with water. After 3 days of "treatment," there is no change in the appearance of the green slime on either side of the shower. What is the independent (manipulated) variable in his experiment? The variable the experimenter is controlling or manipulating and that gets graphed along the x-axis is the variable. It's the part of the Scientific Method that describes the steps to the experiment. What is is called? For an experiment, a scientist put lime at the base of tomato plant A and baking soda at the base of tomato plant B. She then sealed the plants in plastic bags. Tomato plant A eventually died, and tomato plant B stayed healthy.